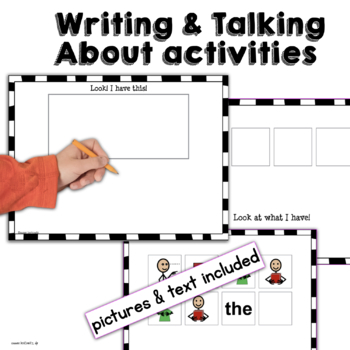 Designed to help you provide engaging activities for AAC implementation, this activity provides practice with early core words. 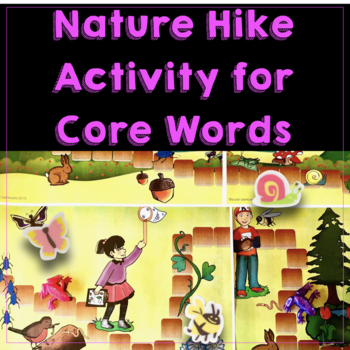 Students who use AAC or have very limited speech practice using core vocabulary while taking an imaginary nature walk with a large game board. ✱ A suggestion list of phrases and a list of the core words is provided, with ideas for where and when to use them in the game. Words featured are from the first 6 months of PrAACtical AAC's Year of Core Words. ✱ A communication board with the 32 core words most likely to be used in the game is also included. 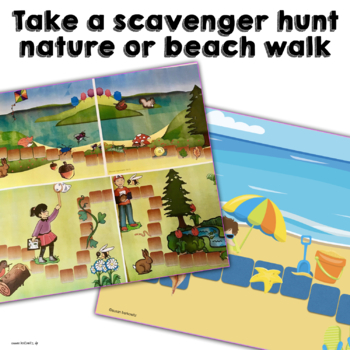 ✱ There is an additional game board for play: A Beach Walk. There is a 3-page game board, 4 playing markers and 4 collect sheets. ✱ There is a page for drawing a picture and writing about it (with core words). If students can’’t draw, cut out a copy of their favorite items from the nature walk and glue it to the picture/writing page. 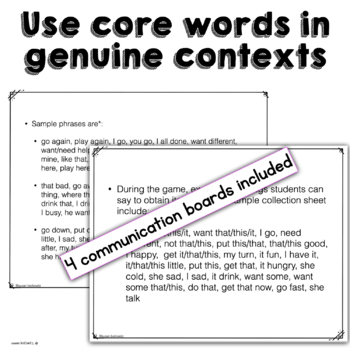 ✱ There are 3 pages of core word cards for students to use in the writing activity as an alternative pencil. ✱ Two smaller core word boards (12 & 20) are provided to use on the walks for students for whom the 32 location board is too big/much. ► For more contextualized practice, take your students for a walk. Model use of core words as you point things out, pick them up, collect them. After the walk, have students show/share one item from their bag. Then have them make the I have __ sentences. There is also a describing communication board to use if needed.